Tethered for support to two metal poles, the two delicate stalks of realistic white blooms frame the southeast entrance of New York’s Central Park like a pair of fairy-scale lamp posts. Stainless steel somehow made delicate by the sculpture’s skill, they rise to 28 and 34 feet tall. 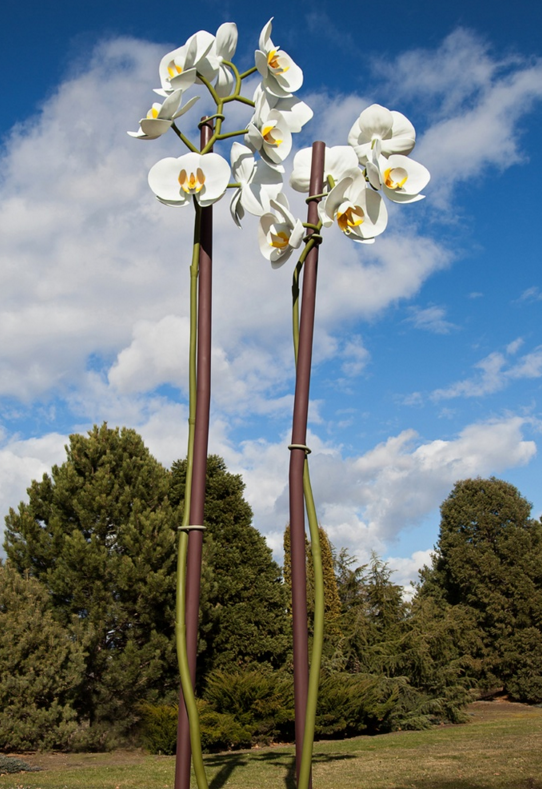 Sculpted by Isa Genzken, Berlin-based contemporary artist, the two clusters of white orchids appear to grow straight from the paving stones of Doris C. Freedman plaza on impossibly slender stems. Genzken’s art is as eloquent as it is massive in scale, the man-sized flowers photo-realistic. They look as though they’d be soft to the touch, if one could just climb to them. These aren’t Genzken’s first monumental flowers. 23 years ago, she installed Rose, a single long-stemmed red rose more than 20′ tall, in Leipzig, Germany. Rose II, a replica of that first one but in pale pink, was displayed outside the New Museum in Manhattan in 2012. Nicholas Baume, the director of New York City’s public art fund and the chief curator who chose Two Orchids, prefers the new work to her roses. “Whereas the red rose is a universal and cliched symbol of love,” he says, “the orchid has a more open set of associations.” He also says the orchid has a “decorative neutrality” that makes it more global. Looking outward from the park, the two stems frame the view of the William Tecumseh Sherman Monument, and beyond it, some of the towering gems of the New York City skyline. Visitors to Central Park before August 21, 2016 should take advantage to get some truly beautiful photographs.